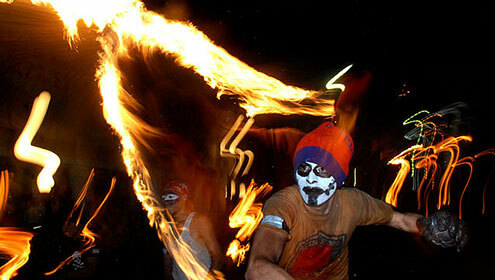 (P1) In El Salvador, hundreds of people celebrated a dangerous annual festival. People throw fireballs at this festival, which honors a big volcanic eruption in 1922. However, another legend says that a local Christian saint fought the Devil with balls of fire. (P2)The festival is not new but there are still no rules. Authorities worry that things might get out of hand one day. Do you think there should be rules at the Festival of Fire? Why or why not? Do you have festivals in your country? If yes, tell me about one? What are some other things people celebrate? Why do they celebrate the festival?